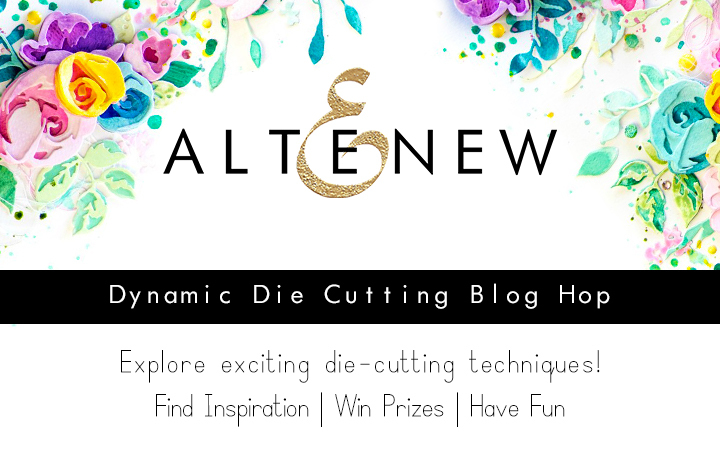 Welcome to our Dynamic Die Cutting Blog Hop! Dies are a quick and easy way to get a striking and dynamic look on your projects! In addition to our coordinating dies, we carry a variety of amazing stand-alone dies including cover dies, word dies, alphabet dies, nesting dies, layering dies, and even 3D dies! This blog hop features projects from fantastic designers, all focused on die-cutting. Let’s get the fun started with a card I created! My card doesn’t have any stamping at all, so it came together really quickly. I started off with a white card base and our Cozy Flannel Cover Die, cut in white. I love cutting cover dies in the same color as my card base, since it adds texture and interest without being distracting. Then, I adhered one of the delicate frames from the Fine Frames Cover Die, as well as a sentiment using the Mega Thanks Die. Both of these were cut with Jet Black Cardstock. To create my focal point, I cut all three layers from the Fantasy Floral 3D Die from Birch Wood Cardstock and layered them with foam tape. The little leaf was cut from Forest Glades Cardstock and adhered to the card with my layered bloom. I love the finished result! Save 15% off on ALL DIES including alphabet dies, cover dies, 3D dies, layered dies, and coordinating dies from 10/25/2018 until 10/27/2018 at 11:59 PM EDT or while supplies last. Shop HERE. No code needed to enjoy this sale! Not valid on previous purchases. Altenew is giving away a $30 gift certificate to FIVE lucky winners! Please leave a comment here on the Altenew Card Blog by Wednesday, October 31st for a chance to win. Five winners will be announced on 11/4/2018. Altenew always has some of the most amazing stamps/dies/products and I love seeing the inspiration in this blog hop – so many new ideas and different techniques I can’t wait to try! I love stand alone dies – my favourites to use! Cover dies are fabulous – love how many ways they can be used. I really love the dies used in this project. The script Thanks die is gorgeous, and the Fancy Floral 3D die set has been on my wish list since it came out. I really like this card! :) The die cuts you used go very nicely together. You got my imagination going! I think it would be fun to put different colors of paper behind the leaves in the leaf cover die. love all the layering you did on your card – gorgeous!! I am looking forward to seeing your DT girls creating some beautiful projects with your new Dies! Such a beautiful card! It’s a fun idea to make cards focused only on die-cutting. Thanks for the inspiration. Die cuts are my favorite!! Love your projects and inspiration!! What a great looking card! Such dimension with all the die cuts. Very nice. I will have to start die cutting more often. Love your beautiful dies. I love working with dies, so much fun!! Great dies!! Such a good idea: white background over white cardstock. I love the fine frame and then the sentiment! I didn’t know 3D flowers even existed, will check them out. I just got the Cozy Flannel die & love seeing how you used it! Gorgeous card! Love using Dies and enjoy blog hops to get inspired. Must admit I’m smitten with the Cozy Flannel Cover Die! I love using dies – what a great blog hop to keep us inspired! Using only die cuts for a card is a great idea! I love the way this card turned out. Great products, lovely card! Thanks for sharing. Some of my most favourite Altenew products are my layering dies. I love the Fantasy floral dies and the Rose flurries and the Peony Dream flowers that these dies make. The inspiration here is fantastic & I can”t wait to see what the other ladies have created. Love the mega word dies. Altenew dies are always unique and absolutely beautiful. I have so many dies on my wishlist! Amazing project . Your die cut section had lots of irresistible items. And I love more that you surrpise us every time with amazing new products.. your cards are so pretty. Wonderful card! I can see many occasions that this card could be used for. Very versatile.